The office block in Dunaújváros is an authentic socialist realist building, which probably has not been restored for decades by the owner, a municipality company. It is being rented to small companies and political parties and for the last two years, the Office of the Hungarian National Assembly has been renting two offices there for two MPs. Both offices are on the first floor, their doors open from a dimly lighted corridor. At first sight, they seem very similar, but there is a huge difference: one is 52 square meters and costs 25.400 HUF a month, while the other is only 35 square meters yet costs 213.000 HUF. “No, no, no. I’d rather not say anything, alright?,” Galambos Dénes, MP of governing party Fidesz kept saying in the Parliament, when asked about his tiny office, which has a price eight times higher than what Lórántné Hegedűs of Jobbik pays for her neighbouring, bigger one. “You should ask the Office of Parliament, which pays the rent,” the politician said in the end. But the Office’s answer did not explain the difference, it merely said that the Jobbik MP only uses the office part-time. This story is just one among many cases which show that not every MP spends appropriately the money they are entitled to for office renting. Out of the 199 MPs 147 uses an office which is paid by the Office of Parliament. During the past weeks, Direkt36, in contribution with television channel RTL Klub, visited 30 of the offices. There were a few positive examples, but we found several offices that not only cost a surreal amount of money but they were also very difficult if not impossible to find. János Lázár, one of the most prominent politicians of Fidesz and a member of the government, intended to polish the image of MPs when he proposed a reform of the MPs’ benefits and compensation. He proposed that the MPs’ monthly salary should get significantly raised, while special allowances, that had often been misused, should be drastically cut. “An MP should be financially independent. This also means that he cannot and need not trick the system. We need to eliminate the need and the possibility of tricks,” Lázár claimed back then. New rules were introduced in 2014: the monthly allowance of MPs was tripled (now they all get 747.878 HUF a month), and extra allowances were cut back. But Direkt36 revealed that the current system can also be violated and one of the most sensitive points is office renting. MPs are allowed to spend no more than half their monthly allowance, 373.939 HUF to rent offices. It is prohibited to rent a place owned by family members, the MPs’ own parties or companies close to them. The Office of the National Assembly pays the rent directly, so that MPs do not get involved in contracting and payments, although, the offices are chosen by the politicians themselves. The offices cost altogether 37 million HUF a month, overhead included. Last year, an additional 2.8 million HUF was spent on office mobile phones and internet fees, and 8.5 million on operations and repairs. The green and lively Szent Imre square, lying in front of Csepel Town Hall (one of the districts of Budapest) seems idyllic early springtime. Szilárd Németh, MP of Fidesz and a former mayor of Csepel, spent 16 years here in the Town Hall, and he still insists to have an office close to the square. In fact, two offices are rented for him here, both from the Csepel Municipality’s company, and both cost 120.000 HUF a month. One of the offices is right in the corner of the square. The other one should be within a five minutes’ reach, but it could not be found at the given address. We tried to reach Németh, but he has not answered neither our phone calls nor our emails. After the publishing of this article Németh told to reporters at a press conference that his office is there and easily recognizable. We went back to check again, we finally found the office with the help of the building’s caretaker but there are no signs either of Németh’s name or that it would be an MP’s office. We also tried to find the Miskolc office of Róbert Répássy (MP of Fidesz), but at the given address there is nothing else but the local Attorney’s Chamber. Yet the Office of Parliament pays 190.000 HUF a month for a 58 square meters’ office there. One of the bureaucrats inside the building told us that Répássy sometimes asks to use the big hall, but he does not have an office there. We asked Répássy about his choice of location. “I needed a place where there constantly is a secretariat which can always tell about my whereabouts,” he said. When asked why he did not even publish the address on his own website, he said that everyone interested in the location can find it out at his office in the Office Building of MPs, which is 182 km away in Budapest. At the address of the Budapest office of László György Lukács (a Jobbik MP) we found crumpling cellars, a discarded iron door, and run-down empty shops. 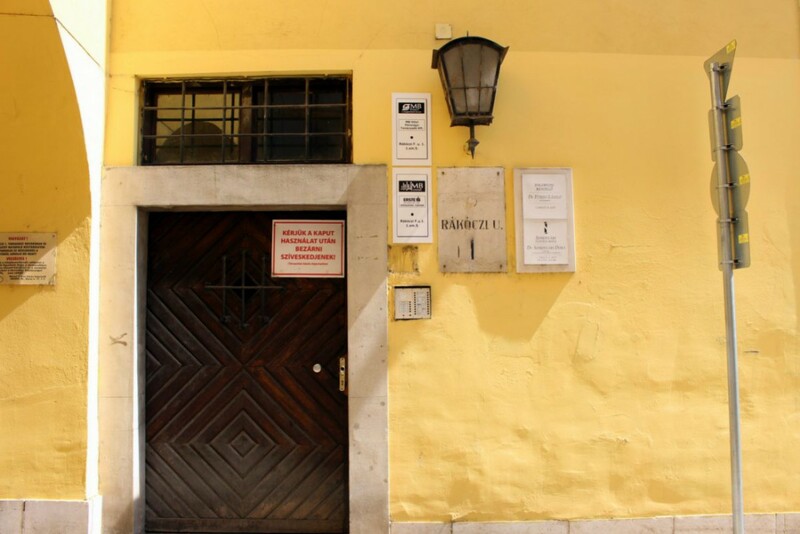 No sign shows that Lukács has an office there but it turned out that the MP rents there a 37 square meters basement room for 179.000 HUF a month. When called by the reporter of RTL, the MP said that he did not think the property was overpriced and insisted that the office can be found at the address. Katalin Csöbör of Fidesz has two offices in the center of Miskolc. One of them can be found easily inside the local Fidesz headquarters, used by the party for decades. The 76 square meters office costs 160.000 HUF a month, just like the other office used by her, which has a size of 67 square meters and should be within a walking distance. But in the building where it supposed to be, nobody has ever heard about it. We rang the bell but no one answered. Katalin Csöbör refused to comment, saying she was too busy. Later, when approached in the Parliament, she said that if we had asked for an appointment, she would have showed us around in her office. She needed a quiet place for meetings, which are impossible to be held at the party office in Miskolc, she explained why she needed two offices. It is far from easy to find the office of the socialist MP József Tóbiás on the outskirts of Szentendre, a small town near Budapest. The office supposed to be in a block of buildings along with a gym, a driving school and a car junkyard. The office is situated on the second floor of a crumbling building, at the end of a corridor. There are no signs to show strangers the way. Thus, it took a while for the reporters of RTL to find it. “What is the problem with the neighbourhood? It is for ordinary, working-class folks,” Tóbiás commented. He chose the office partly because of the “easily reachable” location and that if needed, a bigger room is provided. The 28 square meters office is being rented for a monthly 100.000 HUF. Blanka Zöldi contributed to this article. For the Hungarian company data we used the services of Opten and Céginfo.